Plot: 2154, Earth has been ravaged and is close to ruin. The wealthy reside on the luxurious man-made space station, Elysium whilst the common man struggles on Earth. 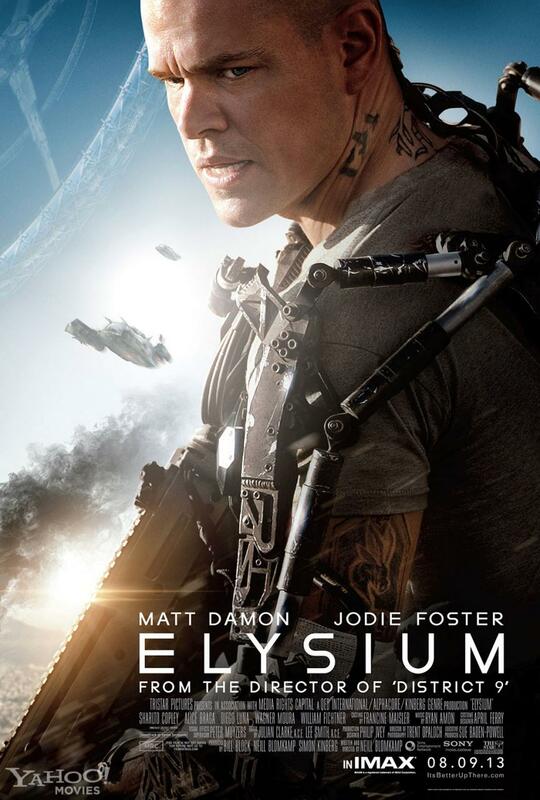 Max (Matt Damon) dreams of reaching Elysium and has grand plans to achieve his goal.. When South African newcomer Neill Blomkamp unleashed his dystopian social critique, District 9, the world sat up and witnessed the genesis of a unique talent. The feature length extension of the superb short Alive in Joburg, District 9 was a refreshingly original examination of mankind’s innate fear of the unknown, compressed in a canister of scintillating special effects. Although Elysium doesn’t quite reach such lofty heights, the combination of phenomenal art design, hard hitting sociological ideology and riveting action set pieces make for a thrilling spectacle. Polished performances from Damon and Foster are overshadowed by another supreme turn from Blomkamp’s fellow native and star of District 9, Sharlto Copley. The power of Blomkamp’s politically relevant humanitarian concerns form the backbone of Elysium and charge the story with an almost magnetic quality. One can’t help but radiate toward and escape into the harrowing yet intensely rich vision of the future. The notion that two distinct strands of the human race exist is explored, people are superceded and effectively defined by their socio-economic status. The wealthy reside in a man-made cocoon of idyllic serenity, immune from the worldly struggles of poverty and famine. In contrast, the average man is left to scrape the barrel and forge an existence on an overpopulated planet which has been ravaged to fuel the excess of the rich. Overtly corrupt corporations draining the planet’s dwindling resources whilst exploiting the working class, sound familiar? The fact that the Elysium structure is visible from Earth serves a powerful metaphor, the second rate illegal immigrant aspiring to the American dream and the promise of a better life. The view of Earth is dazzling, symbolic of the omnipresent beauty and humility which resides in even the most oppressed individual. It was therefore a suprise that the depiction of LA is so dour, there is no middle ground presented which offers hope or light relief. The graphic nature of the violence was unexpected and will certainly feel too vulgar for certain tastes. Neill Blomkamp has firmly established himself as one of the premier sci-fi film-makers at work today. The director’s next project is another film based on his terrific short Tetra Vaal (2003), Blomkamp’s sci-fi comedy Chappie is to be released in March 2015. It will be fascinating to see how his fledgling career develops. If District 9 and Elysium are the South African’s first steps then one can’t help but watch intently for when he starts running.